The innate need of human beings to connect with nature is known as biophilia. 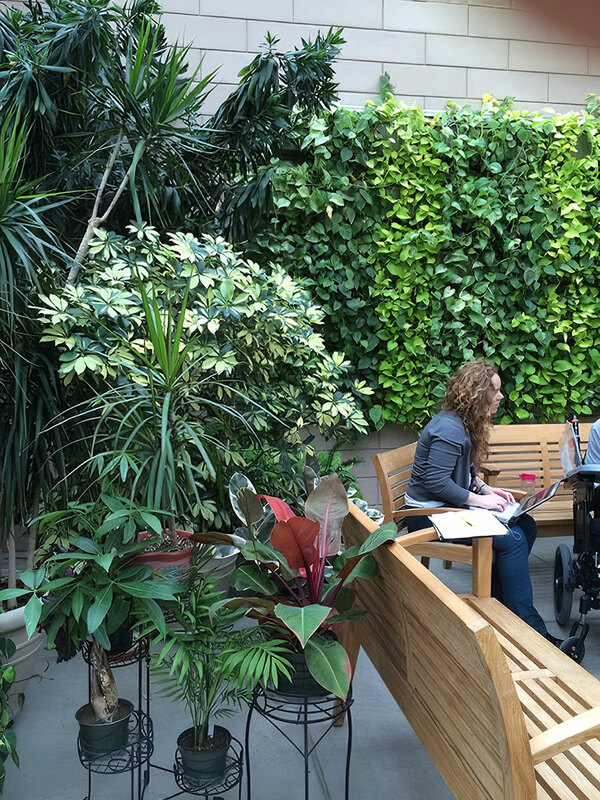 Biophilic research confirms what people know from their own lived experience: bringing the outdoors indoors is beneficial to human health and happiness. In order to nurture this vital connection, biophilic design purposefully incorporates natural materials, plants, natural light, views of the outdoors, and other touchpoints with the natural world into the modern built environment. 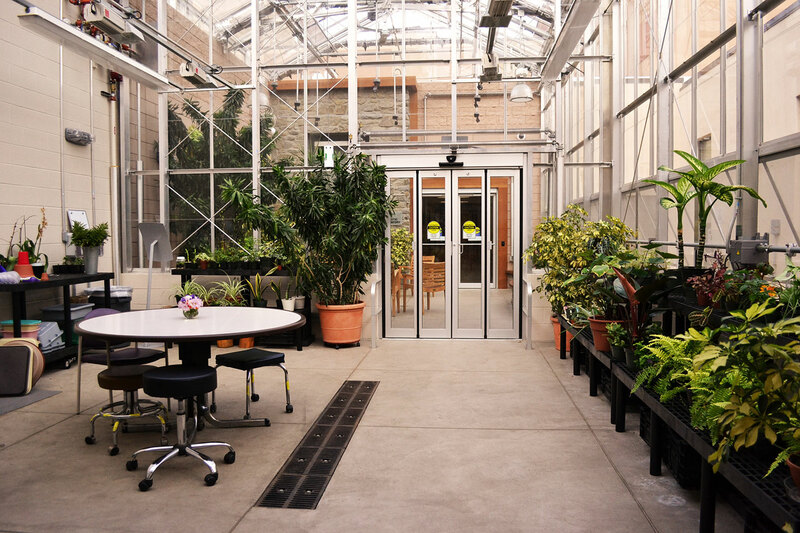 By fostering a connection with nature, greening up the interiors of buildings promotes well-being and brings a surprising array of benefits. Green or living walls can help achieve the benefits of biophilic design. 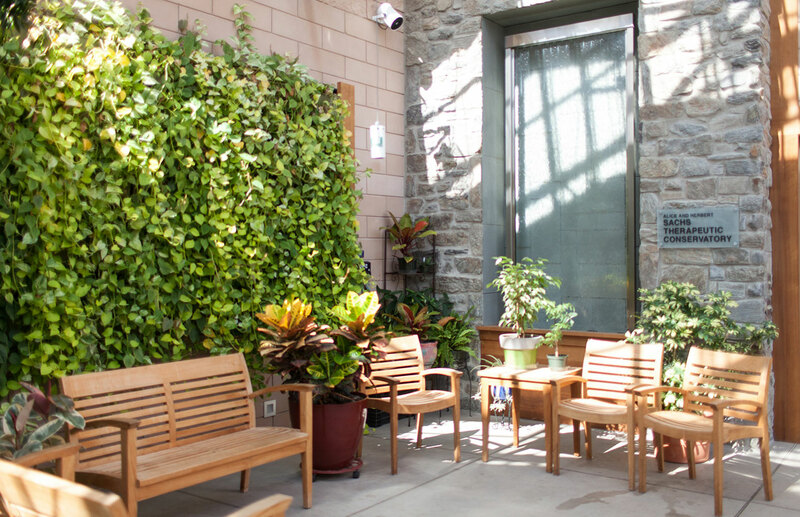 Case in point: the living wall in the Alice and Herbert Sachs Therapeutic Conservatory, which is on the main campus of MossRehab in Elkins Park, Pennsylvania. MossRehab is the physical and cognitive rehabilitation division of the Einstein Healthcare Network. Consistently ranked for 25 years by U.S. News & World Report as a “Best Hospital” for rehabilitation, MossRehab serves people in need of rehabilitation to overcome the effects of spinal cord injuries, strokes, amputations, traumatic brain injuries, and other accidents and medical conditions. 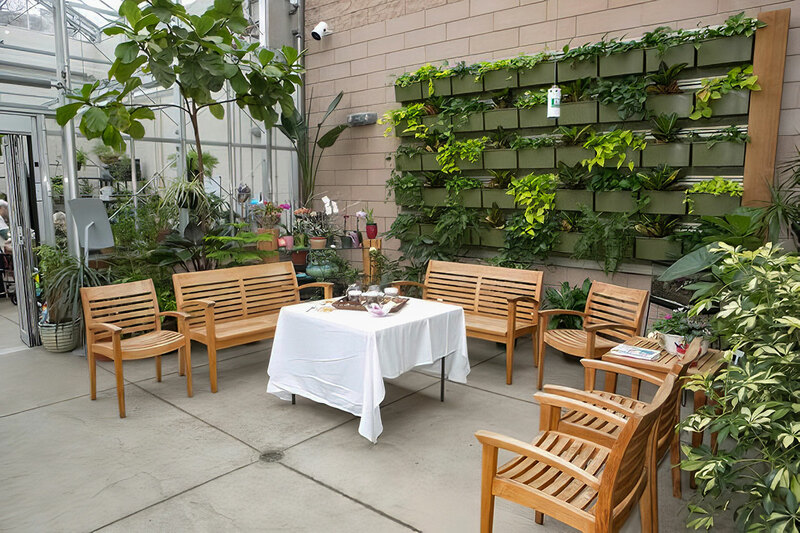 MossRehab opened the Alice and Herbert Sachs Therapeutic Conservatory in 2014 to expand and enhance its horticultural therapy program. “Work” (440 square feet) includes a work table and storage cabinets. “Grow” and “Show” are housed within a Rough Brothers, Inc. greenhouse structure. The Grow Room (530 square feet) is a working greenhouse. 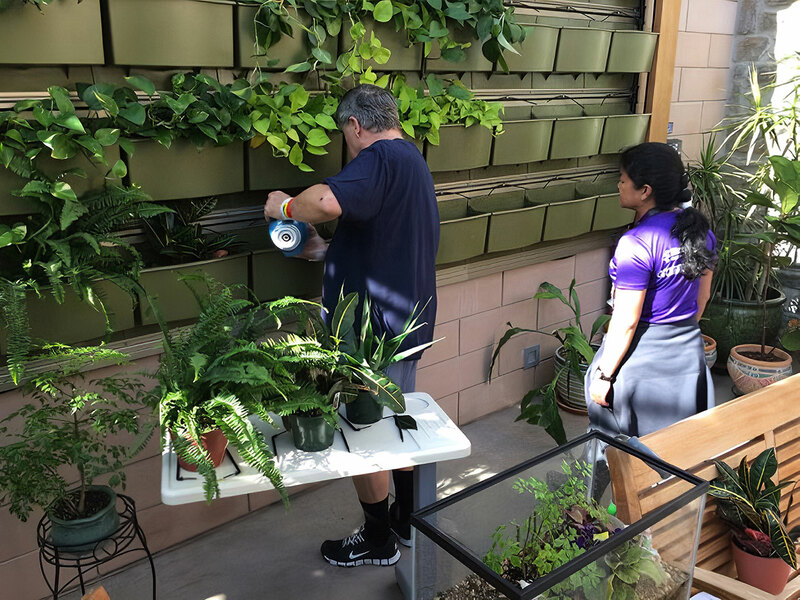 It provides a bright and airy space where MossRehab’s horticultural therapist engages patients in gardening activities designed to help them achieve therapeutic treatment goals. The Show Room (530 square feet) is a plant-filled place of respite. 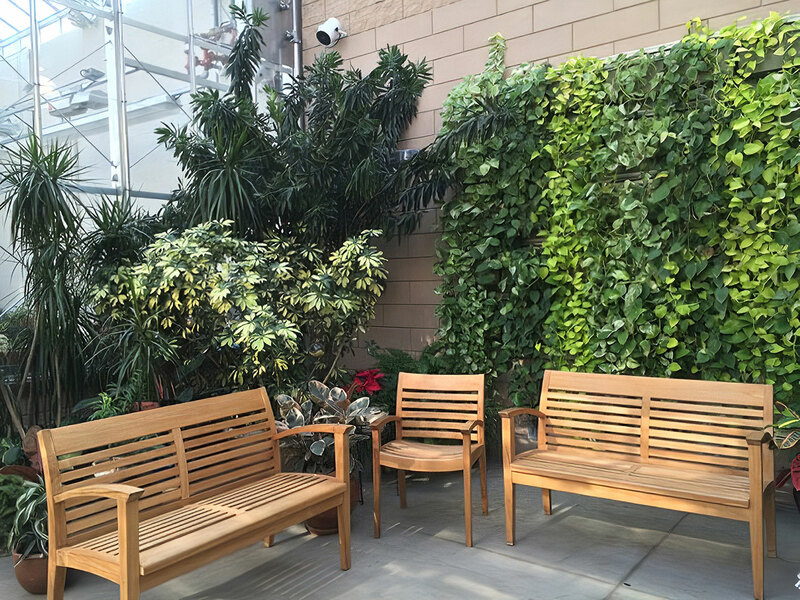 The Show Room includes daylighting, natural cedar trim, natural teak furnishings, potted plants, and accessible raised planting beds. It features a green wall and a water wall. 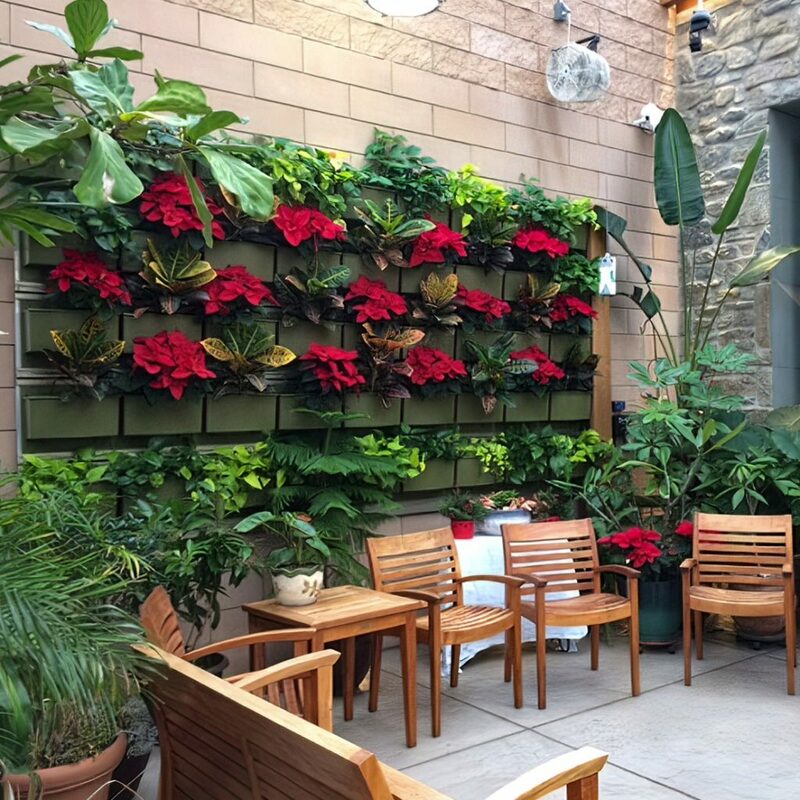 The 84-square-foot green wall (12 feet wide x 7 feet tall) was designed and installed with the LiveWall® Indoor Living Wall System. The adjacent water wall, from Bluworld of Water, LLC, is four feet wide and extends ten feet vertically. It is surrounded by a stone veneer wall constructed with locally quarried Wissahickon Schist stone. Including the stone surround, the water wall feature wall is 10 and one half feet wide by 16 feet high. 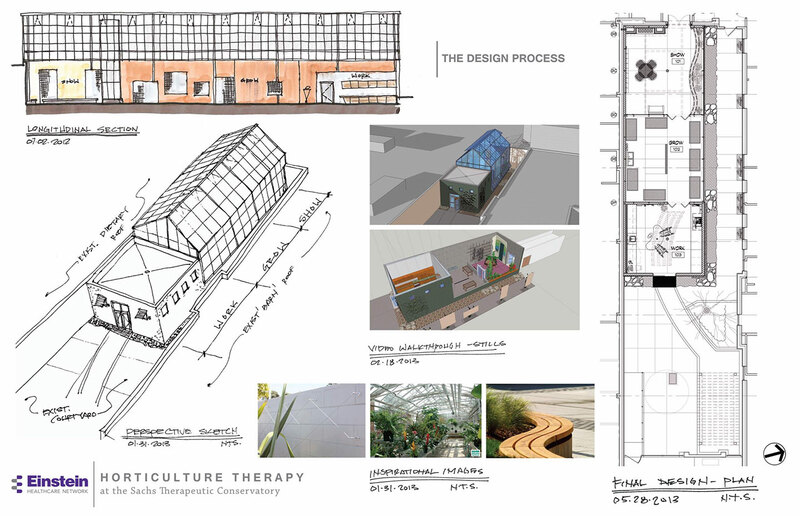 In the planning and design phase of the project (2012-2013), which included site visits to other therapeutic conservatories, a more traditional form of wall screening was initially envisioned for the masonry wall in the Show Room: a wooden trellis structure with plantings growing from the ground. However, it can take several years for vines to climb up a trellis, mature, and fill in. The design committee preferred an alternative that could be installed with full-grown plants, offer the flexibility to change plant varieties, and keep the soil above the floor level. Could a green wall provide a solution? LiveWall is a modular system. To install it, first its vertical furring tracks are attached on the wall. The tracks provide a framework for fastening the other components that form the system. They also establish air space between the wall and the system for ventilation. Horizontal aluminum rails, acting as conduits that bring water to the integrated irrigation components, are affixed to the tracks. The system’s molded modular planter boxes then fit into place and are fastened onto the rails. Finally, separate liner inserts, which are re-usable plant containers with growing medium and pre-grown plants, are dropped into the planter boxes. The integrated irrigation components use drip stake assemblies, which inject water into the growing medium. Connection to nature is part of the healing process at MossRehab that starts with exterior landscaping. When patients, families and visitors arrive at MossRehab, they experience a transition from the busy urban streetscape to a quiet and beautiful landscaped campus. 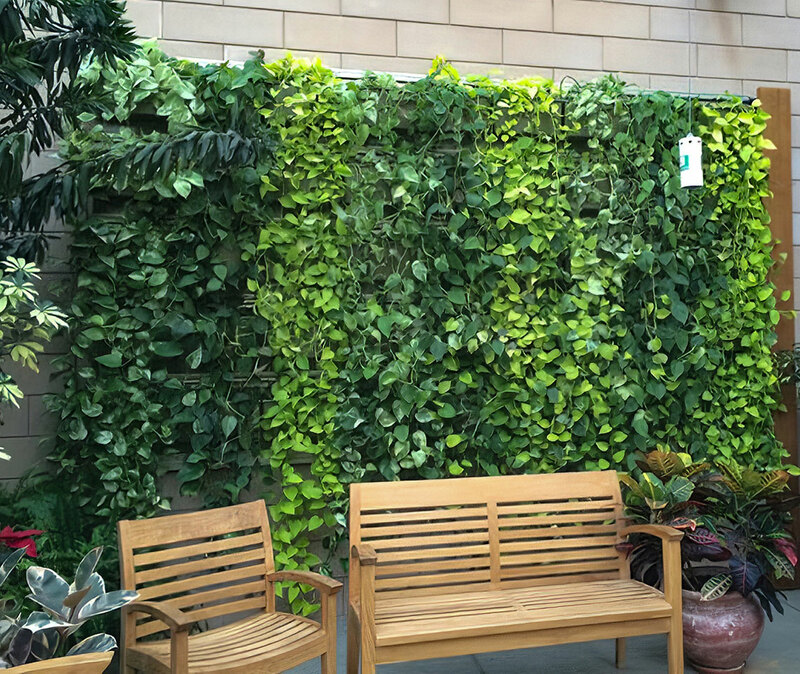 Maintenance is part of what makes the green wall a therapeutic asset. With guidance from staff, patients and volunteers (many of them former patients) grow, plant, and care for the green wall plants. 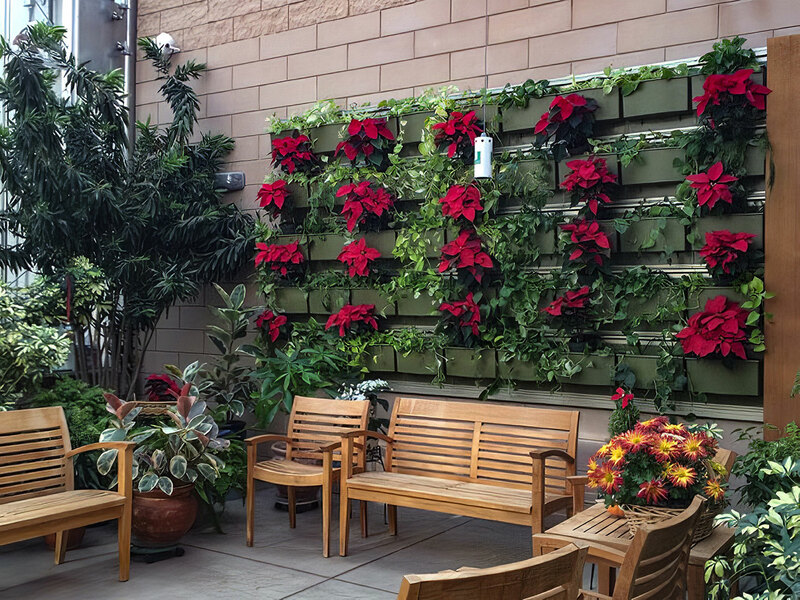 Jaroslow completely changes out the annuals once year and changes other plants periodically, six to ten modules at a time, using poinsettias and evergreens during the holidays or adding decorations and different flowers for special events. Patients follow her instructions to remove the inserts from the LiveWall modular planters, take out growing medium and plants, clean the liners and planters, mix new growing medium, put it into the inserts, add the plants, and water them. Each is a meaningful task. As they follow directions and sequential instructions, patients regain cognitive abilities. Using fine motor skills as they work with the plants improves functional abilities. Social interaction during horticultural therapy provides emotional and physiological benefits. Publisher’s Note: See the the Alice and Herbert Sachs Therapeutic Conservatory Project Profile in the Greenroofs.com Projects Database. 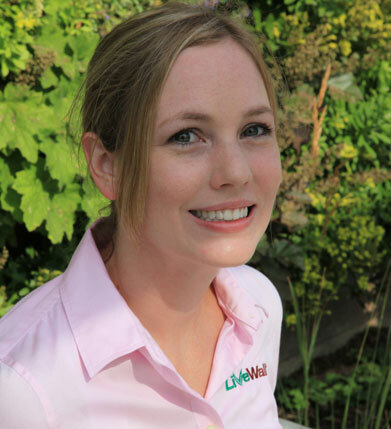 Amber Poncé is the Business Development Manager for LiveRoof® Global, LLC and LiveWall®, LLC. Since 2006, Amber has played a key role in expanding the LiveRoof Global network of professional horticulturists and growers into an industry leading supplier of green roof and green wall systems. She is an accredited Green Roof Professional with more than a decade of experience in green roofing – including experience with growing media formulation, plant selection and production, shipping logistics, and installation and maintenance. 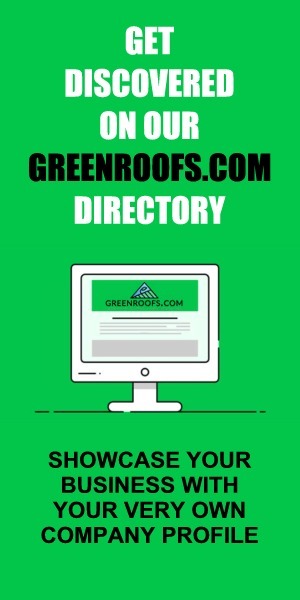 Amber has helped develop green roofing industry standards. She currently sits on the green walls committee of Green Roofs for Healthy Cities. 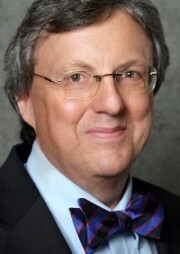 David Aquilina, Strategic Storyteller, is a public relations consultant and freelance writer. An accomplished, award-winning communications professional, he achieves results that showcase his clients, build and boost their brands, and launch and promote their products and services. A frequent contributor to green industry publications, David makes his home up on the edge of the northern prairie near Minneapolis, Minnesota.